While many farmers have been grappling with an exceptionally wet winter, 55 inches of rain annually is standard for Gavin Hamilton, who farms in partnership with his wife Victoria at the Hotts Farm near Lockerbie. The climate means balancing wet, acidic silages in the diet for his 300 milking cows can be an ongoing challenge. 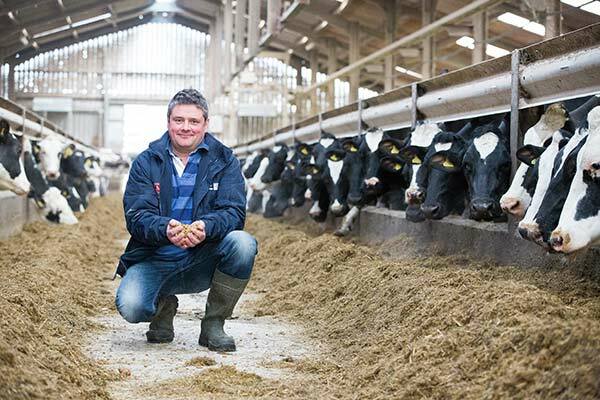 Unsurprisingly with rainfall like this, Gavin houses his 11,800kg herd year round, growing predominantly grass silage alongside some wholecrop on the 300 acre farm, which is in a low-lying area just east of the Solway Firth. Gavin aims for a lean enterprise. Stocking rates are tight for maximum efficiency with replacement heifers sent off the farm at nine months, returning to calve at 22 months. He takes four cuts of silage a year, but with the high rainfall, it’s not unusual for at least a couple of cuts to be wet and acidic. To help manage the impact of this in the TMR, Gavin enlists the help of nutritionist Will Tulley from EBVC. Will also works with Gavin in optimising his production to fill just the ‘A’ part of his A and B liquid milk contract with Graham’s Dairies, who have a standard litre of 4% fat but with heavy penalties for falling below 3.5%. He says Will was concerned about fibre intake, and with the cows looking a bit lethargic there was a risk they had sub-acute ruminal acidosis. Will decided to increase the effective fibre in the ration, introducing nutritionally improved straw (NIS) in early December at 2kg a head to see what effect that had. We’ve always used soya hulls in the past, so to start with we kept them in the adjusted ration but knocked back the content from 2kg to 1.5kg per head. We also cut back on straw from 1kg to 0.4kg per cow, but didn’t take it out completely to keep the consistency of the ration open and loose given the wet silage and pot ale syrup in it. 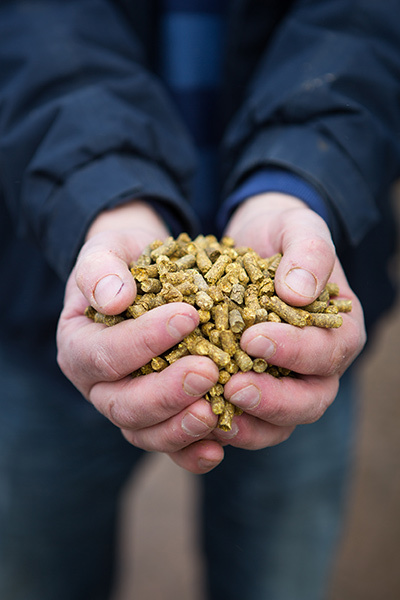 Other adjustments were a reduction in the amount of rapeseed meal fed and a slight overall drop in ration crude protein, while soya was increased to maintain protein quality. Butterfat levels are assessed on a 3-month rolling average, so by January, Gavin was back up to 3.42% average and predicted he’d be back above 3.5% by February. The diet was also tweaked again in January, with Will cutting out Acid Buf because the alkalinity of NIS was helping to buffer the ration, taking soya hulls out completely, and increasing NIS up to just under 3kg per cow per day. The cost of the ration has fallen again, to £3.80 per day. I think the cows are eating NIS more easily than they ate the soya hulls – NIS pellets are slightly smaller and they smell more appetising. So we’ve gone from a position of being penalised around 74p per cow per day due to butterfat penalties, to being penalised an average of 27p. However, the new ration is around 11p per cow per day cheaper, taking that remaining impact down to 15p per cow per day.